Is the forage high quality and available in sufficient quantities? It is not uncommon to find that hay and pasture that appear to be of good quality are actually poorly digestible or low in certain nutrients. By having your hay and pasture grass tested you can assess the nutrient content and digestibility of your forage source. Additionally, most people feed hay by the flake and do not weigh it. There is a lot of variability in the weight of a flake of hay that can be dependent on hay type and the way it was baled. Weighing hay is a good way of determining that you are feeding enough. 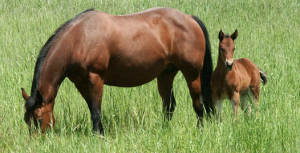 While it is not possible to weigh the grass your horse is taking in while grazing, careful inspection of pastures to ensure that there is an adequate quantity of edible grass present is a good idea. This entry was posted on Friday, July 6th, 2012 at 9:48 pm	and is filed under Articles, Horse. You can follow any responses to this entry through the RSS 2.0 feed. Both comments and pings are currently closed.